First we saw the Japanese Shouting Vase, an ABS resin stress-reliever that mutes the wails of angry or frustrated souls who need to unleash their fury without disturbing the peace. 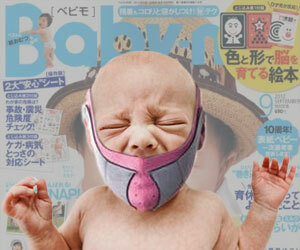 Now the brilliant minds of Japan--perhaps in direct response to one of my own suggestions for Shouting Vase use--have developed the Baby Muzzle, a noise-canceling mouthpiece that fits over the heads of infants and toddlers ages 0 to 3 to mute their cries, fits of rage, shrieks of delight, any esophageal emissions that slice through the air affronting innocent ears in the same way long, wet farts at the start of an elevator ascent to the top of the Burj Khalifa or Willis Tower affront innocent noses. The beauty of the Baby Muzzle design is that it doesn't prevent children from voicing their discontent, it merely relieves those in their vicinity from the burden of having to listen to it. A fuzzy pink strap--some derivation of mesh or otherwise ventilated material I believe--with an embedded sound diffuser comprise the cozy-looking mandible cloak, which affixes snugly at the back of joyous bundles' heads with a Velcro closure. Once in place, precious buttercups are primed to be seen but not heard nearly anywhere. Obviously, this sort of peacekeeper will occupy its highest and best use at 30,000 feet. In fact, a flight full of Baby Muzzles and Knee Defenders may be the closest we'll get to a pleasant flying experience ever again. Additionally, restaurants, movie theaters, church services, wedding and funeral ceremonies, full nights of sleep--these places and events constitute invaluable locations for Baby Muzzle application, not only for strangers whose eardrums must otherwise undergo the torture of ungodly tonalities and pitch, but also for parents who have given up on partaking in adult activities due to having been cursed with a demon baby who never stops screaming. Using the same noise-slashing circuitry found in high-end headphones, the structure of the Baby Muzzle's mouth cup establishes an internal barrier that both blocks high-frequency, and erases low-frequency sound waves. The result: complete, sweet silence. Nearly. Since the baby still has to be able to intake air through its mouth (i.e., breathe) fabric ventilation provisions and an incomplete seal on the kisser cup permit some noise to escape. However, the Baby Muzzle guarantees its decibel level will not rise higher than the hum of an airplane in flight, or the chatter of a dinner party. The manufacturer also points out that sometimes when babies cry it is not just because they're being needy turdballs, but because something is actually wrong with them, so the subtle noise emissions will keep parents aware that they should check on the little guys every now and then to make sure they aren't in need of a diaper change, or turning abnormal colors. I feel like Americans might not like the Baby Muzzle too much. Partly due to its stifling of children's innate behaviors and oxygen supply, and partly due Americans' desire to be offended and outraged by things. But just as barking dogs and smacking gum are considered unfair strains on strangers in public, so too are loudmouthed mini-mes. 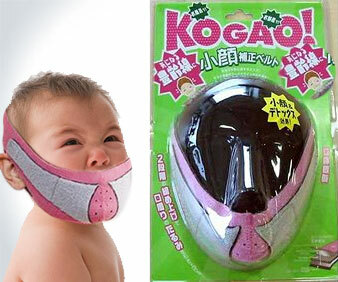 The Baby Muzzle simply suggests that those unaffiliated with a child's conception should not have to listen to it cry.